Burrowing owls are so incredibly cute when they’re little! Early morning shot; hence the big eyes. 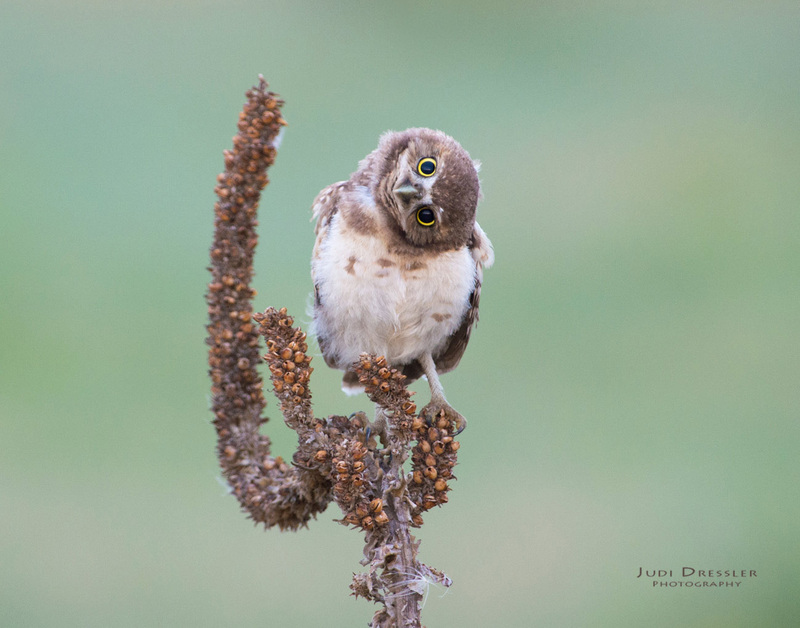 This adorable young owl is one of four siblings remaining in a family of burrowing owls. She is still being fed by her parents, but is hunting on her own too, and is getting better at catching grasshoppers and other bugs. You can see some barring at the top of her chest, which is the beginning of barring that will cover her entire underside as an adult. I don’t recall seeing an adult burrowing owl do this head turn, but the little ones do it regularly. Their eyes are fixed in position, so they can’t swivel their eyes the way we do, and so this helps them judge position and distance to be able to size up prey or a threat. They can even turn their heads further — up to 270 degrees! This photo was taken near Greeley, Colorado, on July 26th, 2017, at 6:38 a.m.